View More In Serving Spoons. Made in France from a single piece of the finest olive wood, this handcrafted cook's spoon offers original beauty (no two are identical) and exceptional convenience in the kitchen. The spoon's round head works well for stirring soup, mixing ingredients, and for keeping veggies moving in a hot-oil wok, while its long handle helps keep hands a safe distance from the heat. The all-purpose utensil features a lovely satin finish, made up of a combination of mineral oil and beeswax, which protects the wood and offers added strength and resilience. The use of wood not only brings the beauty of nature indoors, but it has also been found to be more hygienic than plastic. 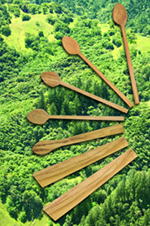 Furthermore, out of respect for the environment, the particular olive wood used by Berard comes from sustainably managed forests, so the spoon can be enjoyed for years to come and with peace of mind. Safe to use with all cookware, the cook's spoon measures approximately 13-7/9 by 2 by 1 inches and should be hand washed only and dried thoroughly after each use. Berard is located in the mountains of Royans, which border the northern edge of Provence in France. Since 1892, Berard has specialized in creating kitchen products from carefully selected woods such as beechwood, boxwood and olivewood. The quality of Berard products are the result of a century of know-how. The Berard objective is to offer the best in kitchen and decorative wood products both in traditional as well as innovative shapes and materials. Because Berard has been making wood items for over a century, our artisans truly understand the various woods and how to best create wonderful and useful articles from this warm and beautiful material. Our products may have irregular graining, veining or knots. 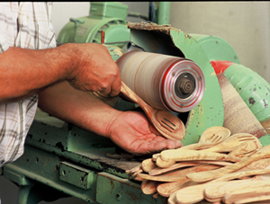 Each piece is hand crafted based on the characteristics of the wood it is to be made from. Whether using these articles for cooking, serving or decorating, these unique items not only highlight your good taste but also your enjoyment of natural things. Each piece is artisanaly produced by artisans who are adept at working with wood. The unique nature of the wood means that no two pieces are alike and dimensions will vary from piece to piece. The little imperfections in the wood are characteristic of the hand crafted nature of each piece. The quality of Berard products are the result of century of know-how. Year after year, Berard has been synonymous with quality, authenticity and reliability. All of our olivewood items come from agricultural orchards and each tree is cut with respect to the laws that protect each country and the use of olive wood. Wood is a natural resource which is crucial to the balance of life on our planet. Using it as a raw material means respecting it from its origins...the forest or orchard...all the way through to recycling. On these issues, Berard's position is one of clarity and integrity: only species from forests and orchards which are managed in a sustainable manner are used. Respect of origin, strict management of quantities and careful selection of species are long-standing values at Berard. If you have any questions about this product by Berard, contact us by completing and submitting the form below. If you are looking for a specif part number, please include it with your message.